Mix all the above ingredients except bread crumbs. Do not add water. Recipe Contributed and Photographed by my sister PK. 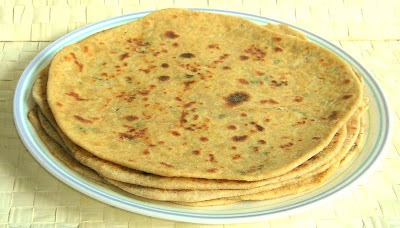 Thankyou Saffron Hut, for sharing the wonderful recipe for Mooli Paratha. It came out really well. 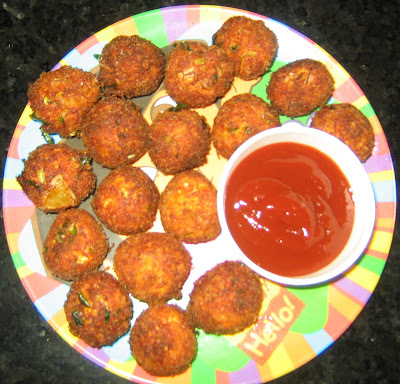 Before trying the recipe, I was wondering whether I would be able to roll a stuffed patty. I could do it. I followed the exact procedure for the Ingredients as well as Method. 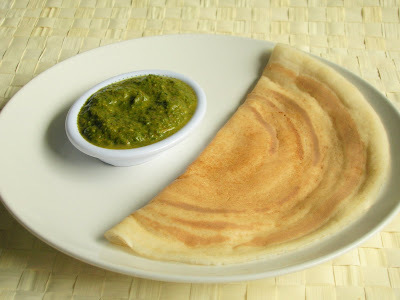 Why wait for Navarathiri, to taste this delicious, healthy, quick and easy meal. 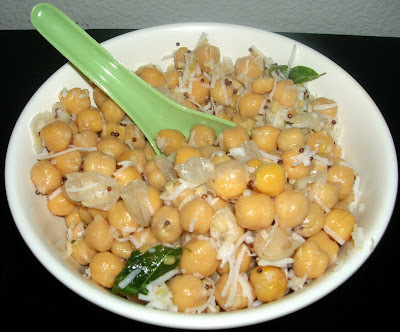 I always have a stock of this Garbanzo beans, so pre-planning to make this Sundal is not required. Just 2 minutes and the Sundal is Ready. 2 Cans Garbanzo-Beans/Channa beans - Wash the Beans and Keep Separately. Soak 1 Cup Dry Channa beans overnight and boil in water until cooked. Cool and Keep it aside. Heat oil in a Pan. 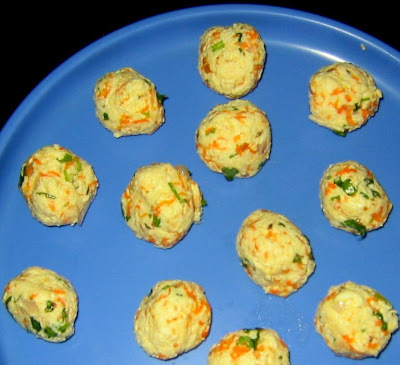 Add Mustard Seeds, when it sputters, add Urud Dal, Green Chillis, Asafoetida powder and Curry Leaves. Add the Beans, Grated Raw Mango and Salt. Give it a stir. Turn off the Heat and Add Coconut and Lemon Juice. Stir well and Serve immediately. 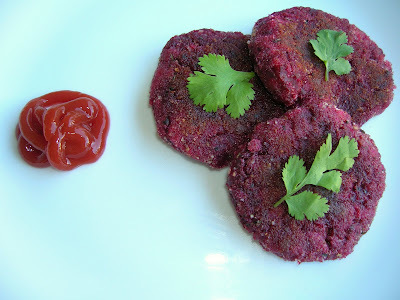 This is the recipe for my version of Beetroot Pulao. I like this colorful, healthy Beets. 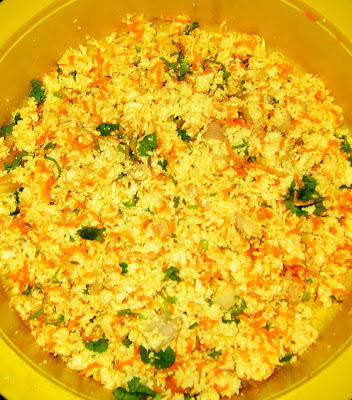 The heat for this pulao comes from the MTR Pulao Powder. 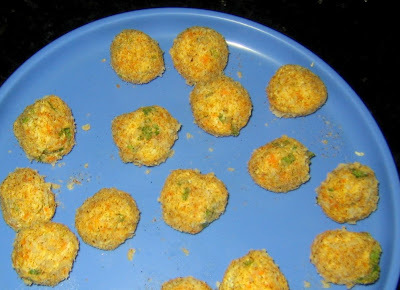 Green Chillis or any other brand of pulao powder can be substituted in the place of the MTR Pulao Powder. In a Pressure Pan, Heat oil. Add the Cumin seeds, Bay Leaves, Cloves, then the Onions. fry the onions. 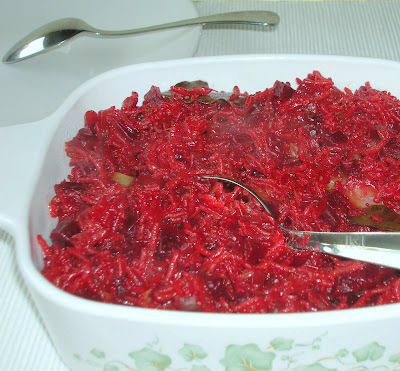 Add the diced Beetroot and the chopped Cabbage. Add Garam Masala and MTR Pulao Masala Powder and stir. Serve warm with Raitha of your choice. Here is the recipe for my version of Chinese style Vegetable Fried Rice. Very easy and very tasty too. I used Sona Masoori Rice for this Fried rice. I think any rice variety, short or long grain will make a perfect tasty fried rice. Steam Cook the Mixed Vegetables. 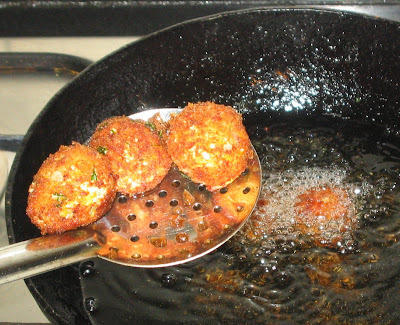 Heat Oil in a large Kadai, Add the Onions and fry for a couple of minutes. Then, add the Green Bell Pepper. Saute for another 4 to 5 minutes. Mix in the Steam Cooked Mixed Vegetables. Fry for a couple of minutes. Add the Tomato Chilli Sauce, Worchestershire Sauce and Salt. Stir. Add the cooked Rice and Stir Gently. Add the Soy Sauce and Stir Gently until Even Distribution.